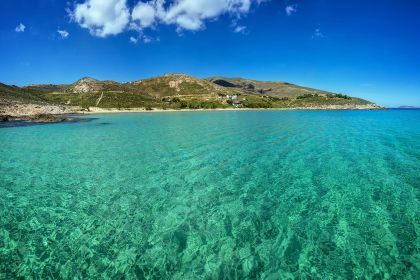 Less touristy than an island such as Naxos, Serifos – just a short sail from Athens – features rolling hills, beautiful sandy beaches and laid-back restaurants offering bountiful meals. 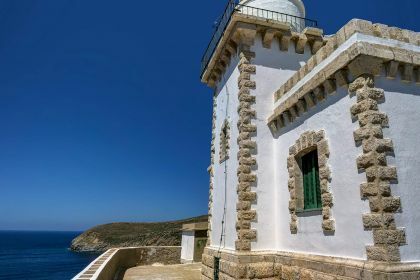 There are also many places of cultural interest, including a 17th-century monastery, and traditional villages dotted with whitewashed homes and smallholdings. Call or contact your friendly Abberley charter broker here for assistance in planning an unforgettable yachting vacation in Serifos and the Cyclades. 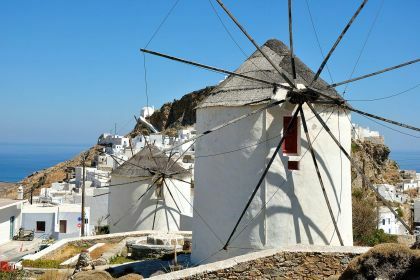 Serifos has a tranquil, rural atmosphere. Outside of the capital, the hilltop Hora, and the port, Livadi, the island is sparsely populated and not very touristy. Many of the island’s most beautiful beaches are accessible only by 4X4, so cruising in your luxury yacht along the coast, you’ll find many secluded coves and secret spots to call your own. Don’t miss Psili Ammos beach on the east coast, with its soft golden sand, turquoise water and trees offering welcome shade. It’s a hard-to-get-to spot and there are no sun loungers and umbrellas – a perfect spot to while away the day being pampered in privacy aboard your yacht. Snorkelling is a dream on Serifos, where spectacular rock formations are home to schools of fish. The crystalline waters are also excellent for scuba diving – you can even explore the wreck of a World War II merchant vessel. On land, the 17th-century Taxiarchon Monastery, near the interior village of Gilani, is a wonderful arrangement of turrets and tiny windows. Dedicated to archangels Michael and Gabriel, the whitewashed interior is home to beautiful frescoes. Set in the square in the main town, or Hora, Stou Strato – which serves typical Greek dishes – is an excellent choice for day or night al fresco dining. In Livadia, head to To Bakakaki, which is renowned for its excellent steak and other meat dishes. A block back from the main harbour road is Metalleio, which has a cosy terrace and a small menu filled with more unusual dishes, including piglet and quinoa salad with peach and ginger vinagerette. The courtyard at Barbarrosa, in the Hora square, is a great, vibey place for a drink. Set on a deck right next to the beach at Livadakia beach, this restaurant-bar is the perfect spot for a chilled sundowner accompanied by the lapping of the waves. Ready to relax aboard your own yacht while discovering the best of Serifos? Contact one of our experienced brokers, or call us now or contact us via the form on this page. Insider tip: For stunning views, some of the best island eateries and narrow cobblestone streets, consider going up to the Hora. It’s best to take a bus or a taxi on the way up and walk back, stretching your legs without unnecessary strain.